Tryals Shop Crash Pack - Available for all modern bikes USING AJP CONTROLS. (Scorpa, Montesa, Beta, Gas Gas, Sherco, Fantic) Specify bike application when ordering. The Crash Package includes the following spares: 1 Pair of Grips, 1 Front Brake Lever, 1 Clutch Lever, 1 Throttle Assembly, 1 Throttle Repair Kit, 1 Brake Reservoir Kit, 1 Clutch Reservoir Kit. 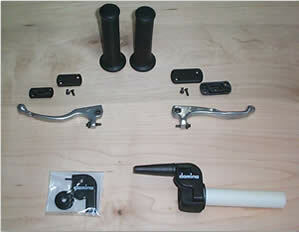 Levers are available in polished and black colors/long or short version AJP. Throttle assemblies from Domino come in several versions. Most common for trials are the slow throttle (black plastic barrel - 124 degrees) or the fast version (white barrel - 96 degrees). The throttle repair kit consists of an extra throttle lid and wheel. AJP master cylinder lids are available in three sizes fitting all modern applications. Grips are available in soft, medium, or hard compounds.